I made this home screen for the recent U.S. Independence Day, July 4. I was browsing hi-res NASA photos and, like most ideas, this image of the astronaut and flag inspired me and I ran with it. The header and footer were both made with Zooper Widget Pro. All visual bits have associated hotspots that open other apps. 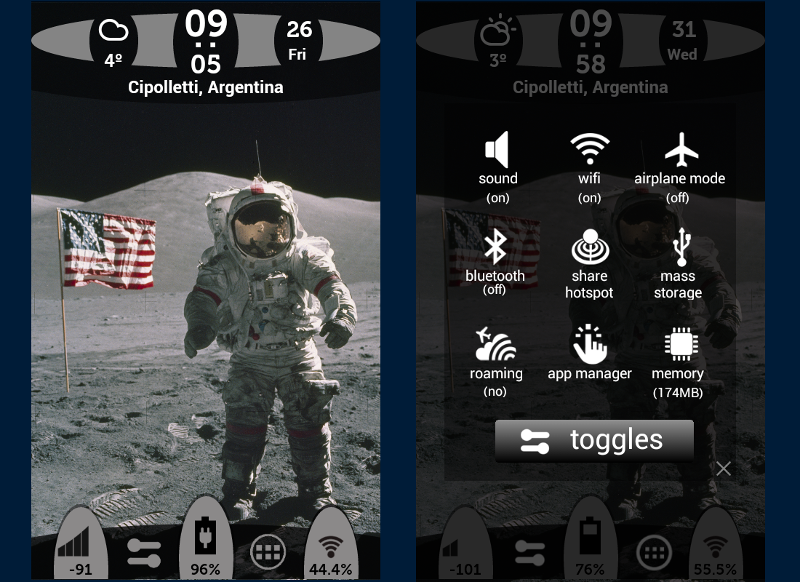 For example, by tapping on one of the four elements in the header I can launch weather, alarm clock, calendar, and maps. Similarly functionality appears in the footer. I use SwipePad, which uses hotspots at the screen's edges to launch apps. This basically frees up a lot of space on my home screen. As a result, this home screen only has one page. Efficient for me, but frustrating for people like my wife who don't know where those hotspots are. It's not part of the home screen's design, per se, but one thing I really like is my custom toggles screen (footer, second icon from left). This launches a "scene" that I designed primarily in Tasker, which has a lot of included toggles for wifi, airplane mode, etc. For those toggles that either (1) Tasker doesn't have or (2) Android won't let you manipulate unless you're rooted, I used Automagic which has a neat Control UI feature for creating a routine that quickly executes a series of button taps on your phone's interface.